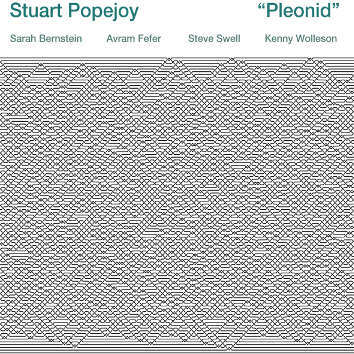 Pleonid is a large composed work which takes up the whole CD - 59'37. It is a single track, with indexes to allow navigation at roughly 7-minute intervals. The work is generated and scored by software which Stuart developed between 2007 and 2012. To record the work live he put together the band of New-Yorker improvisers: Sarah Bernstein - violin, Avram Fefer - alto sax, Steve Swell - trombone, Kenny Wolleson - vibes and drums, Stuart Popejoy - bass guitar. You can read about this algorithmic composition techniques in the liner notes.